You are here : Home >> Blog >> Home Repainting Tips that can sell your Property for More Bucks! Painting is one of the most cost-effective ways of enjoying better returns on your property. But not every painting job offers the best return on investment. Using unconventional color choices can force the buyers to stay away from your home. Here are a few tips to help you make the right decision. Are you going to sell your home in the near future? Are you looking for ways to improve the resale value of your home? Well, you do not need to undertake expensive renovations to ensure a better selling price. Expensive upgrades and unnecessary home additions will not prove to be fruitful if you do not consider the buyer perspective. However, there is one thing that often helps homeowners in getting the best value for their property. Painting your home offers the most benefits to sellers and makes sure that your home gets the deserved attention from prospective buyers. Zillow.com, a popular real estate website, recently conducted a survey in which it analyzed more than 32,000 photos from houses sold across the USA. It studied the impact of colors on the sale of a home. You may believe that painting the house in egg-shell, beige or white shades will deliver better returns but the survey revealed that different shades of blue meant adding more greens to your wallet. Powder blue bathroom and soft gray-blue kitchen escalated the selling price by at least $5,440 and $1,809 respectively. So, the bottom line is that you should move away from neutral colors and opt for cool shades of blue. Homes with darker walls tend to block natural lighting, give a dull look to the room and make it appear smaller than before. Even if your house has enough windows, it is best to avoid dark colors on the walls. You may love them but dark shades are an acquired taste; not everyone likes it. So, if you have painted the walls with dark brown, dark grey, super black, inky black, etc., it is best to choose another color. Even when you use dark shades for the exterior, the home absorbs more sunlight and thus, makes it hotter. Also, it will reveal all the imperfections and thus, reduce the overall value of your house. If the neutral walls in your home look relatively new and you do not want to spend money on painting them again, do not worry. You can jazz up an area with bold and bright pillows. A dark brown rug can bring together the entire room. Adding a bright picture frame can help you as well. Also, for the exterior, you can simply paint the front door in bright blue color. Highlighting the exterior molding is another way of adding to the beauty of your home. Now, choosing the paint finish is as important as choosing the color. Different sheens have different effects on the walls of your home. Glossy paints are very durable and they repel moisture. But they give a very plastic-like feel to the surface. If you are looking to paint the bathroom or the kitchen backsplash, semi-gloss paint is a more suitable option. Remember that lower the sheen, the better it is for hiding minor imperfections. So, choose semi-gloss finish or eggshell finish when you want to reduce the visibility of nail pops and uneven walls. When you want to sell your home at best price, you need to stage it properly. And, painting your home is a significant part of the staging process. Hire professional home painters who will not only ensure beautiful painting results but will also help you with minor repairs. If you are confused about making a color choice, you can work with a team of color consultants and find the best colors that suits your home. So, get ready to paint your home and ensure that you get top dollar for your property. Do you want to hire Toronto home painters for painting the kitchen or bathroom? 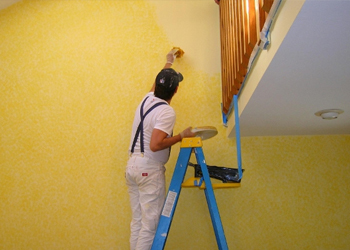 Whether it is interior home painting or exterior house painting, Perfect Painter promises stunning results every time. Get in touch today.